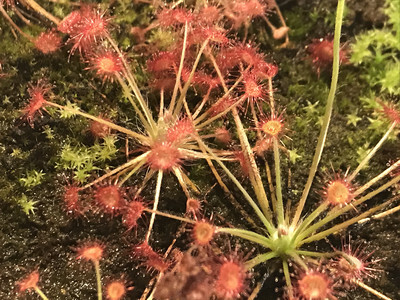 The Drosera petiolaris complex sundews are found in northern Australia in a region with lots of rainfall and hot temperatures in the summer, then lower rainfall but still hot temperatures in the winter. They prefer temperatures in the low 30°'s C (mid 80°'s F) and bright during the day and do not like temperatures below 18° C (65° F). Drosera paradoxa is the easiest species in the group to grow because it can tolerate lower temperatures and light.